A warm congratulations to the teams tireless work and she looks drop dead gorgeous in that superb matt colour scheme! Waaaay COOL! We cannot have too many of these aircraft. Perhaps the closest the US came to having a comparable aircraft would be the B-25 Mitchell? I do know there were variants that mounted a cannon in the nose and were used for ground attack and also anti U-boat patrols. Between 500lb and 4,000lb of internal stores in bomb bay (reconnaissance equipment, specialized mission equipment, leaflets, munitions, extra fuel, etc...). 1 x 57mm autocannon in nose (in place of 4 x cannons). 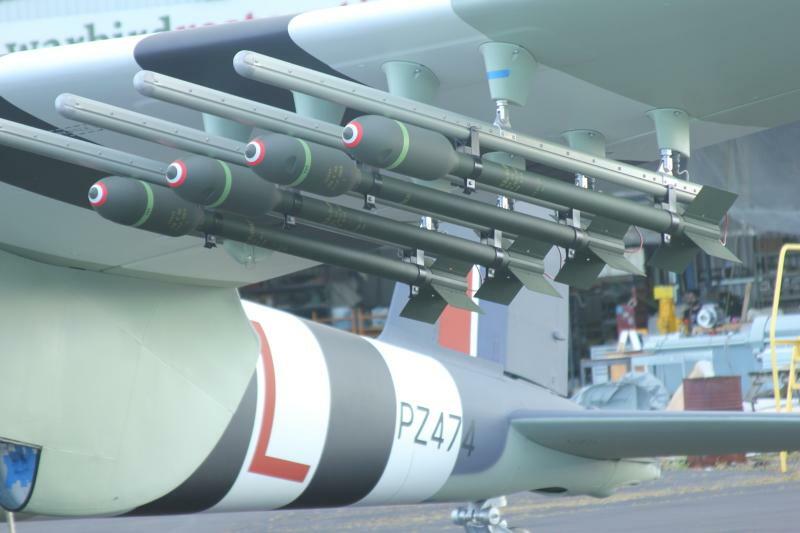 4 x 7.7mm Browning machine guns in underfuselage gunpack. 8 x High-Explosive, Armor-Piercing rockets underwing. Amazing for a 99% wooden aircraft, shows what the Merlins power had to lift it all! It's just BRILLIANT! Well done to the rebuild team. The P-38 would be a close second. My Squadron maintenance hangars in Downsview (Toronto) were part of the original DeHavilland Mosquito assembly line. The buildings still had a lot of the original bolted in track/rail system along the assembly floors. It stirred a lot of reflection on where they were sent and how many that were built survived. I've always thought they were such beautiful aircraft; flying art really. When I was just a little guy, probably around three, my uncle gave me a 1/48 model of one he had built. My mom rigged it with string and hung it up in my room. You know, that thing has followed me everywhere I've lived ever since. I'm in my later 40's now and it's still hanging from the ceiling in my library. An excellent restoration when you consider the starting point of the project. Only Flying De Haviland Mosquito Arrives!